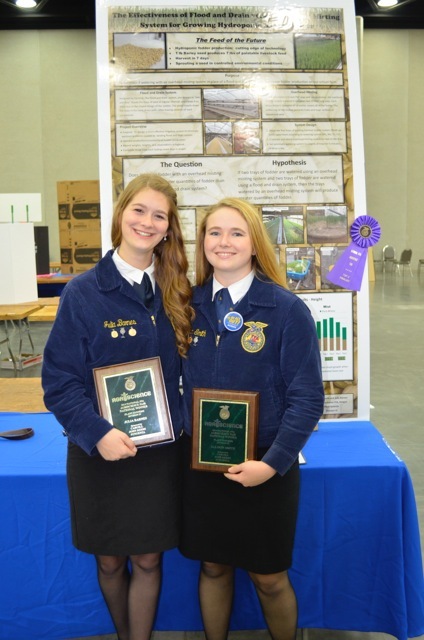 In Louisville, Kentucky at the 87th Annual National Future Farmers of America (FFA) Convention and Expo, two North Clackamas FFA members, Julia Barnes and Allison Smith, were honored with the top award in the Agriscience Fair, Plant Systems category (10-12 grade team division). This competition is for FFA members who are interested in the science and technology side of agriculture. Julia Barnes and Allison Smith proudly display their awards. The young agriculturists presented research on barley fodder which they grew and studied at the North Clackamas Sabin-Schellenberg School Land Lab. Barley fodder is animal feed derived from sprouted barley seeds. This type of feed is economical and nutritious for livestock. The girls studied whether irrigation with an overhead misting system would work better than the flood and drain system that was previously used in fodder production. Results showed that the overhead misting system not only had, on average, greater production yields and consistencies, but was more nutritionally beneficial for the livestock. Madeline Sheveland and Christine Gonzales, Canby FFA, who received a bronze award in the Food Products and Processing Systems category (10-12 grade team division). Nine Clackamas County students were recipients of the American FFA Degree award. These awards are given to FFA members who have demonstrated the highest level of commitment to the FFA organization and have made significant accomplishments in their supervised agricultural experiences. Annually, 3,500 American FFA Degrees are awarded to deserving students. This award is presented to less than half of one percent of all FFA members, making it one of their highest honors according to the National FFA Organization. Congratulations to all Clackamas County award winners!